If I were a bee, iHerb would be my honey. If I were a moth, iHerb would be my light. If I were a magpie, iHerb would be my shiny thing... You get the picture. 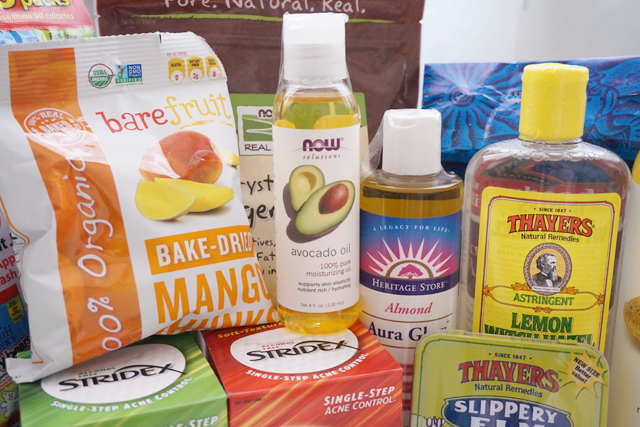 I mean, iHerb is online shopping and grocery shopping combined, and that is basically my biggest, unhealthiest addiction. This haul marked my 7th and final haul for 2013. It is also my biggest because I threw in some healthy snacks as part of the usual will-only-stick-to-it-for-the-first-few-days New Year resolution of eating clean (So not going to happen. But you know, you still make it your NY resolution because it's a tradition. Haha. And I had Maccas' Breakfast Deluxe this morning. After yoga. HAHAHA.). Arrowhead Mills' Organic Oat Flour: Oats are extremely calming and moisturizing for eczema and heat rashes. I add a little water to this and use it as a face and body exfoliator. The flour is fine enough so it won't choke up your sink. Heritage Products' Aura Glow - Almond: I LOVE almond oil. It's incredibly moisturizing, significantly lightens marks and keeps my skin really clear. 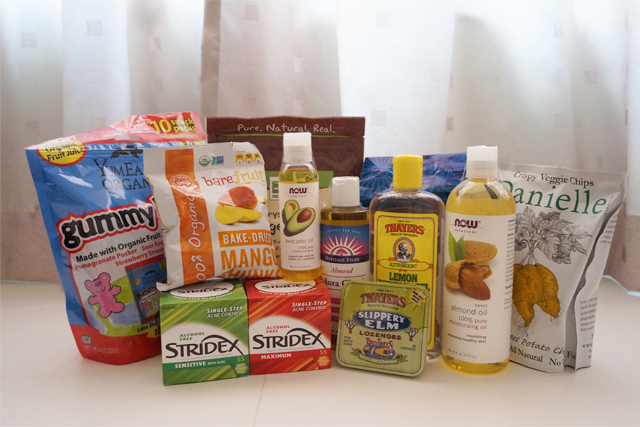 I typically use a different brand (Read on!) but a model mentioned this one in an interview so I thought I give it a try. Now Foods' Solution - Sweet Almond Oil: This is my 3rd bottle! BUY IT! Stridex's Single-Step Acne Control - Maximum (Alcohol Free): JH has been using this, in place of Paula's Choice's BHA. He mentioned that it worked just as well and he has really good and clear complexion, despite sleeping weird hours (Life of an architect.). I got this for the sister. 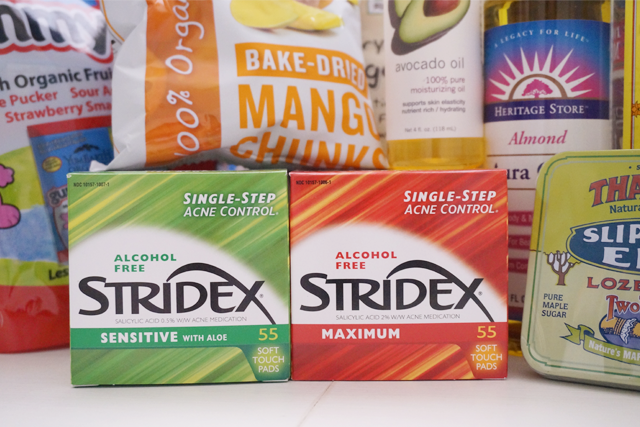 Stridex's Single-Step Acne Control - Sensitive (Alcohol Free): This is for me! Thayers' Lemon Witch Hazel with Aloe Vera Formula: Thayers' has been my toner for a large part of 2013. It's huge, cheap and does the whole toning job splendidly. Bare Fruit' Organic Bake-Dried Mango Chunks: Just because it's mango. Huge obsession with mango sticky rice now. I know, so NOT healthy. Danielle Chips' Royal Sweet Potato Chips: I ate these last week. You can skip them, unless you just love hearing things go crunch-crunch in your mouth. They were pretty bland. Thayers' Two Trees Slippery Elm Lozenges - Pure Maple Sugar: I really ordered these just because they are from Thayers' but man, are these awesome! You know how some nights you wake up and your throat's all dry and itchy. So you swallow repeatedly and then it starts to hurt? I usually take Sanjin Watermelon Frost Lozenges but I ran out of them so I tried these, completely NOT expecting them to work. BUT they did! And without leaving any sappy Chinese herbal taste! Yummy Earth Organics' Gummy Bears: They are GUMMY BEARS. Everyone needs them.